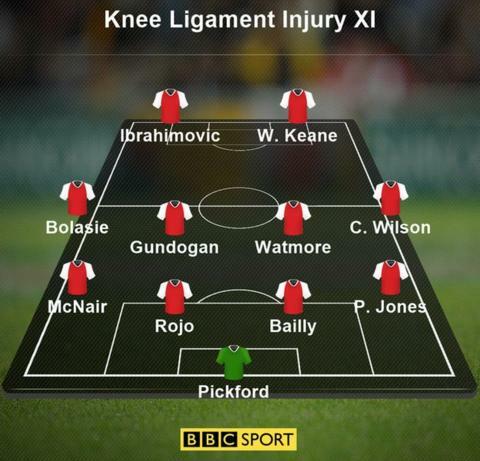 Are serious knee injuries in the Premier League really at 'epidemic' levels? Last season 28 Premier League footballers suffered serious knee ligament injuries - that's the highest number in the past five campaigns. And there were 17 anterior cruciate ligament (ACL) injuries - the most serious kind - which was again more than any of the previous Premier League seasons. BBC Sport pundit and former Chelsea winger Pat Nevin says "knee problems appear to be at epidemic proportions in the game at the top level" and has called for further research. A Radio 5 live Monday Night Club discussion will delve into the issue, and BBC Sport has looked at the available data and examined what the possible causes could be. The knee joint has several ligaments. The medial (inside) and lateral (outside) collateral ligaments connect the upper and lower leg and help keep the outside of the knee joint stable. The anterior and posterior cruciate ligaments are in the middle of the knee. The main role of these is to stabilise the knee when a player is turning, twisting, pivoting or pushing off. As football is such a high-intensity sport for the lower limbs, if cruciate knee ligaments are ruptured, the earliest a player can hope to return to match fitness is nine months. Various theories include players' changing physiologies, the amount of football played, footwear, and modern, harder pitches. Dr Bilal Barkatali, a consultant orthopaedic surgeon specialising in sports knee injuries, suggests overplaying and fatigue is the key reason, particularly in high-level footballers. "In the case of Zlatan Ibrahimovic - he's 35 and has kept himself in very good condition. Despite that, the weight of Zlatan coming down from jumping to head the ball and landing safely requires all his muscles to be firing at the correct time to support his joint. "So if he is fatigued and is landing and one specific set of muscles haven't fired in time then all that force will be going through the middle of the knee joint, resulting in this rotation-type force around the knee causing an ACL rupture. So fatigue and overplaying is a really strong factor in how these injuries come about. "In the past 15 years there has been an increase in knee ligament ruptures - that's throughout leagues and amateur competition." Colin Martin, a footwear expert for a company that has worked with several sports clubs, says "softer, less supportive boots" are a factor, as is the pace of the game "increasing vastly". "The two combined probably plays a big role in increased injury rates," adds Martin, who designs inserts that give "more stability to foot and ankle, which in turn means the player has a more solid foundation to work from". In modern turf construction, long deep artificial grass blades are sewn throughout the pitch, which firms up the ground and prevents slipping. Leicester City's grounds manager John Ledwidge said: "We know that those working within the game - namely managers, players, physios and sports scientists - perceive that there are links with pitches and injuries. But they need to establish why that is the case. "I'm not a closed book and arguing that it's not a contributing factor because everything is a contributing factor when it comes to players. "On any one weekend, with the ridiculous transfer fees that are flying around at the minute, we could have upwards of £300m-£400m worth of assets playing on our pitch. "Certainly at Leicester City we work exceptionally to hard to make sure the pitches are kept within certain parameters of firmness, there's an adequate level of moisture, the grass coverage is there for pretty much most of the year, to ensure the players don't get injured and the players have the best possible playing facilities that they can have. Nevin said that when he was the chief executive of Scottish club Motherwell in the early 2000s, he was so concerned about the effect of modern pitches on his players that he looked into reverting to an "old-fashioned" turf pitch, but was told it "wasn't considered financially viable". "We need further statistical work obviously but I have heard many complaints from Premier League managers that the modern ultra-hard pitches seem to be exacerbating the problem," said the former Scotland international. "On top of this remember the players are training on precisely the same style of pitches every day as well. I know for a fact that some managers are concerned about this and have to accept it limits the time some players are able to train. "Yes the game continues to get faster, but the lack of 'give' in the modern pitches certainly has an effect. I did my ACL while at Everton but that was an impact injury, due to a tackle. There appear to be more of these that are not player on player impact and that has to be researched. "In the simplest terms, modern pitches look fantastic, they are beautifully flat and can cope with huge wear and tear. The groundsmen make them look beautiful for the TV, but when the changeover was happening did anyone ever ask the players, the managers or the medics what was needed? "Having played on many types of pitch I see the problems of each, I just hope that 20 years down the line there aren't a group of players whose knees, ankles and hips have been irreparably damaged." According to research from SportingIntelligence.com and insurance and risk specialists JLT, Premier League clubs paid a total of £177m in wages to injured players last season. The estimate is calculated from fixed salaries paid to players and the length of time spent on the sidelines. There were 108 knee injuries last season - second only to hamstring injuries (131). However knee injuries were the most severe - the with the average player missing 70 days with a knee problem. Knee injuries were the costliest injury, paying out an average of £448,719 per injury and total of almost £50m over the season. JLT's head of sport Duncan Fraser said: "We seem to be seeing a case of injury-flation this year. Over the last six seasons there has been a steady increase in the cost of injuries as players become more and more expensive and the Premier League becomes more and more competitive. "Injuries don't just make it harder to manage a team, there is also a direct cost associated with it, in the form of salaries paid to players who can't take part in matches." Listen to BBC Radio 5 live's Monday Night Club on 24 July, from 19:30 BST. Morata, Lukaku, Lacazette - best deal? Read more on Alvaro Morata, Romelu Lukaku, Alexandre Lacazette: Who will bring most success?